The Aarrow TF90 stove is one of the biggest boiler models on the market – this Aarrow stove has a flat top & 1 plain door with glass in it. The glass is kept clean by the airwash system. 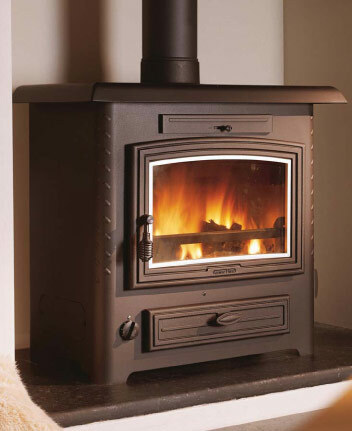 This Stratford stove weighs 18kg & there is an optional stand available if you want to raise the height of the stove. As we live in a largish bungalow, heated by LPG, I needed a boiler stove which would heat our 12 radiators and provide warmth to a large open family room with kitchen. The TF90 coupled up nicely to an H2 panel so the pair work seamlessly together via our HW/CH programmer – just an automatic gas boost needed for HW in the mornings, when the TF90 is not being used. We are delighted with the whole system and it has saved a great deal of fuel costs over this last winter. We could not live without the log boiler now, so have purchased its baby brother for our house in S.Spain. We have 16 (some very large) radiators in the house and heat the whole house on the TF90b stove. Our house is not double-glazed since it is a listed building. It takes about 2.5-3 full wheelbarrows of soft wood per day to heat our water tank (200 litres) plus the central heating system. The house is comfortably warm and we do not need to top up with oil. After only 20-30 minutes lighting the fire, the water tank is up to 60C and after that the heat is transferred to the radiators. When it is very cold outside, -5C or below, we top up with house coal. It is absolutely fantastic! Worth the investment.